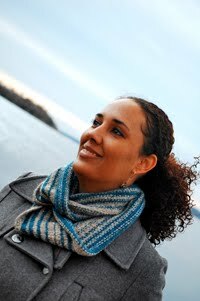 Cambria Washington: knitwear & patterns: I made stuff! 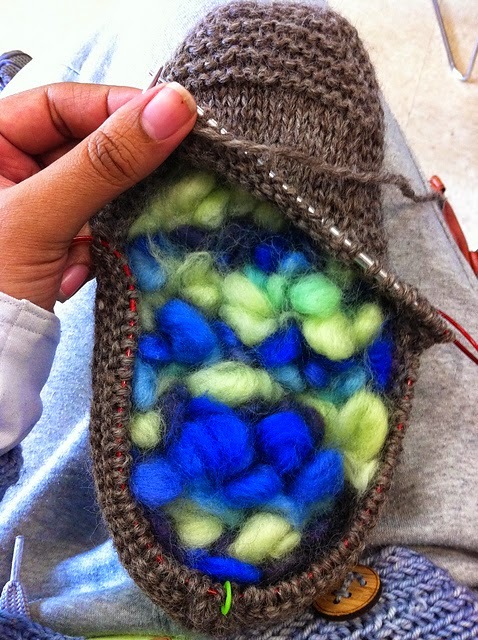 I have been in love with the Cadeautje slipper pattern from Ysolda's Knitworthy book for months now, and after patiently waiting, she released this as an individual pattern. I love the whole book, but I don't really wear any of the other things in the book. 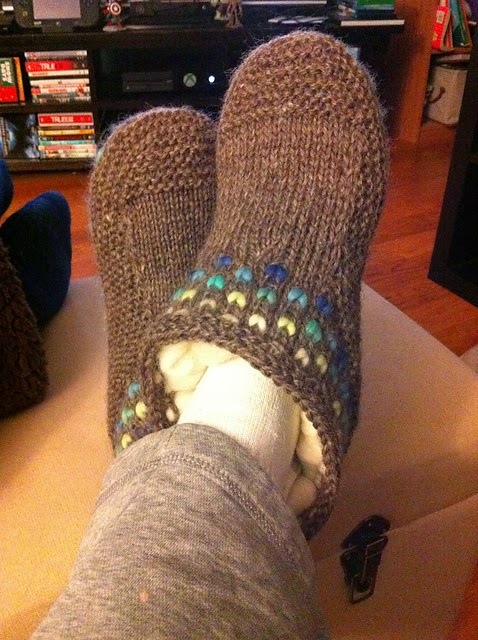 I have, however, been after a sweet, sweet pair of thrummed slippers for a long time now. These are amazing! 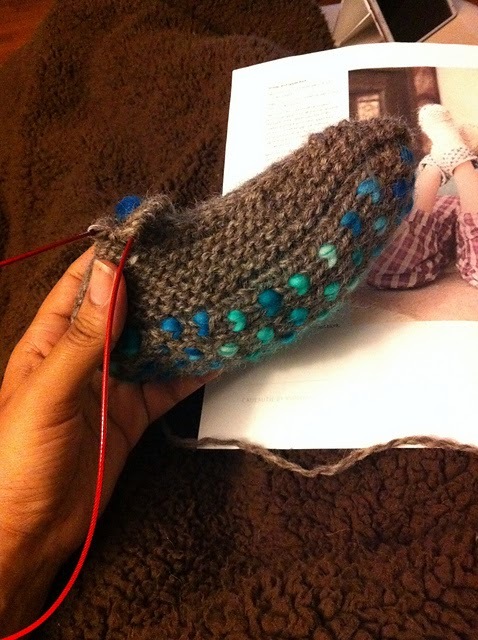 I'm actually wearing my finished pair now as I type this. I also cast on immediately for a little pair for Alex, per his request. I also bought more roving to knit another pair with different colored thrumms...just in case. The pair I made here used some yarn that my good friend Heather brought me from her mother's enormous yarn stash, and the roving is from Play At Life fiber arts (surprised, right...). It's in Jacks Lament and was part of a club from several years ago so I'm not sure if she still makes this colorway, but she DOES make several other fabulous colors so go on over and take a look. Now I'm not sure when I last posted, and I was too lazy to look back on what was going on in my life at the time, but I've had some stuff going on. I was injured at work and after a long time waiting to have an MRI, I was informed that I completely tore my ACL and partially tore my MCL. I've been out of my classroom for 6 weeks, working on light-duty, and I've been doing physical therapy for the past few weeks. I'll be visiting an Orthopedic surgeon soon to determine whether surgery will be necessary or not. If so, I'll definitely be knitting, lol. Who am I kidding. I'll be knitting either way. 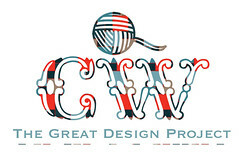 My husband has chosen my next project for me. He want's a new sweater to wear to work, and he decided on this one because it looks like John McClain's sweater from the first Die Hard. We watched that recently and he loved the sweater, so I'm gonna knit him one. 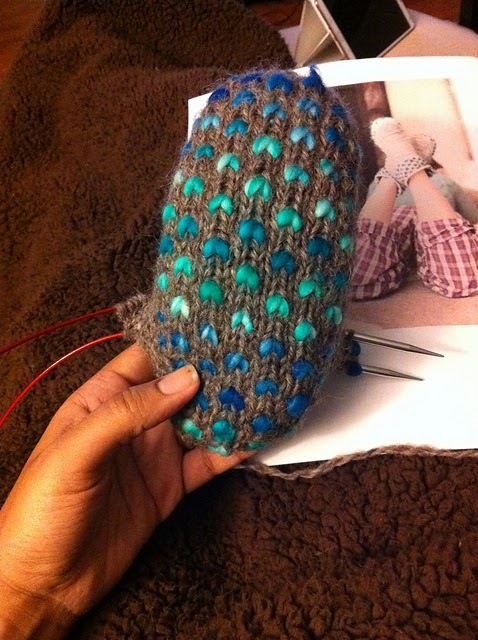 Right after I knit a hat for a friend going through chemo. The hat comes first. It's freezing out here in the winters. In other news, I'm still chugging along as the Primary President. They haven't given up on me yet, lol. I have all new teachers, new counselors, and a new room within the building. I spent hours today finding printables for our binders, and purchasing new theme posters for the Sharing Time room. I always thought those were provided until I became the Primary President. Little did I know that our Bishop's wife had been paying for them all along. They make a huge difference in how well the opening exercises go, so I decided that they needed to be part of the Primary budget, and I bought some nice ones from an Etsy shop, and had them professionally printed through staples. I'm excited to put them up in the room. I also typed up letters for parents letting them know what to expect from Primary, because we have so many new members that many don't have any formal experience with Primary. I'm excited about this opportunity to help them learn about what Primary does and why it's so important for the children to attend. Let's see how things go.